Mutants is probably not your first choice for a beach read unless you are a geneticist or medical professional. It is a fascinating book. It is educational both for its genetic insight and for its historic perspective. Mutants is comprehensive and unafraid to explore challenging questions of ethics, bias, racism, human experimentation, and other controversial subjects. Although it is written for a general audience, it assumes a great deal of previous knowledge for its readers (or easy access to a large dictionary). Armand Marie Leroi is a professor in London, and the subject of Mutants became a television documentary after its publication. Throughout Mutants, the author stays true to his teaching roots. We learn about different mutations, the causes and possible reasons they persist in our species, the genetic changes that underlie mutations, and the historic and medical responses to these mutations. More than that, however, Leroi introduces us to people who have lived with these mutations. He does not allow readers to forget that real people with real lives are the subjects of this book. Some of them are victims: most mutations are harmful and many are fatal. They can be debilitating, disfiguring, and painful. But regardless of their circumstances, people, with families and friends, with lives of their own, are the subjects of this book. “We are all mutants,” the author writes, and he makes that point using examples and stories throughout the course of the book. Leroi is clearly fascinated by what mutation teaches us about human development. He poses questions that I suspect most of us never considered. Several of these relate to conjoined twins. One question that cannot be fully answered is whether the conjoining is an imperfect separation of identical twins, or whether it is a merger of separated twins who grow back together. Another question deals with the internal organization shared by most humans. Conjoined twins are typically organized internally the way most of us are. The exception is when they are conjoined side by side. In those cases, organs in one twin are often reversed: the heart on the right side instead of the left, with similar displacement of other internal organs. In extremely rare cases, individuals who were not twins (conjoined or otherwise) have similar reversal of their internal symmetry. Given the rarity of this phenomena, it seems that the usual placement of the organs confers an evolutionary advantage that is not immediately obvious. Mutants does not find the answer, but it asks the question: why? Why should it matter that the heart is on the left side? I honestly had never thought about it before–it was where it was. But the fact that it is so extremely unusual to find this reversed, and then almost always only when there is a disruption in development as significant as conjoining twins, makes me quite curious to learn the answer. Hopefully, someday, we will. Some mutations remain isolated, rare, but clearly heritable. Some families are known for generations of members who are literally covered in hair, including foreheads, cheeks, and other areas where virtually no hair grows on the rest of us. Arguably, red hair is a mutation of that sort, with a relatively few people from specific European countries exhibiting that coloration. Other mutations also span generations but create more physical challenges than cosmetic differences. Leroi cites examples of families with “claw shaped” feet. And some mutations, like Huntington’s disease, are deadly, but the effects do not appear until middle age so they do not directly impact the reproductive success of its victims. This example is part of an intriguing chapter that questions whether ageing is itself a type or series of mutations–and if so, whether it is something that can be treated or even reversed with advanced medical care in the future. Leroi clearly accepts that humans are one species. Mutations may make the Afe (Pygmy) tribes smaller than the average people, they may make the Dutch taller than average people, they may make Europeans in general more prone to baldness and may make Africans in general less susceptible to malaria (than are Europeans), but those mutations do not change the basic humanity of us all. Indeed, there is on average more genetic diversity within any given people group than there is between any two groups of people. That being said, though, he does believe that more research into the differences between “races” should be done. Given the terrible history and awful political applications which accompanied such research in the past, though, I am wary of this suggestion. Mutants is a sensitive, detailed, challenging book. 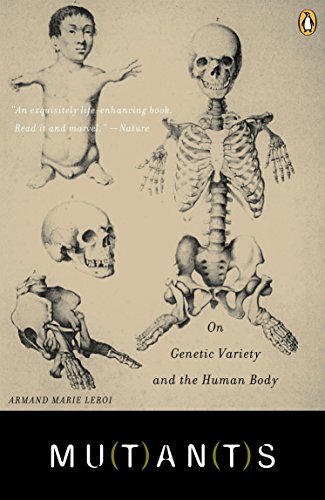 It is not for every audience, but readers with an interest in genetics and human differences will find it fascinating. Fundamentally, it is a celebration of how intricate our bodies are, how easily that intricacy can be undone, and how resilient humans are even in when facing amazing challenges. Quote: One benefit of Summer was that each day we had more light to read by.